Bread holds much importance here at the cooking school, and has since the beginning. Ian talks about this a lot in his Basic Breads and Sourdough 101 classes. 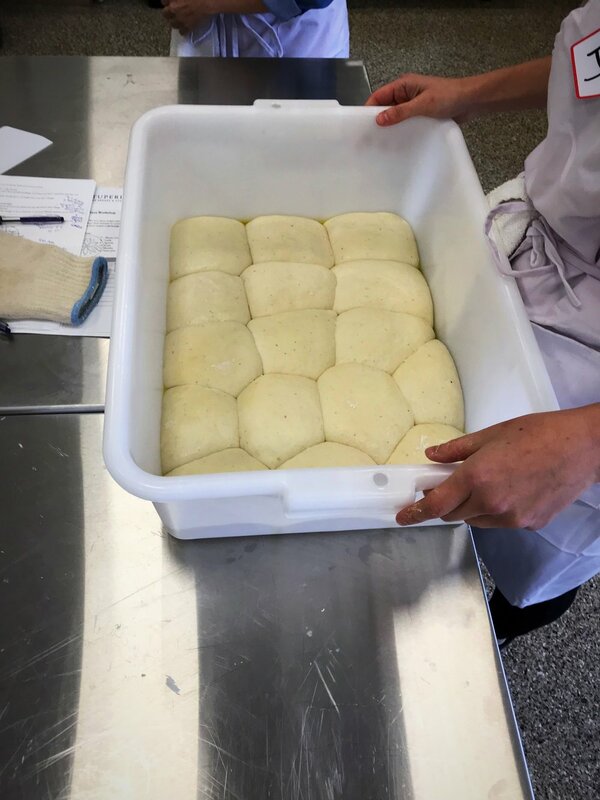 Bread, a universal symbol of community shared by every culture, was to be central to every class - from Parisian to pasta, fresh baked and broken together at the start of each meal (hear more from Ian on bread in Episode 1 of The Farm Cooking School Podcast). While we don’t bake a loaf in every class today, this general principle holds true, the togetherness that bread represents felt broadly across all classes at the school, glutenous or not. And this connection extends beyond our kitchen as well. Integral to the school and its mission is the work of a community of farmers, chefs, students, and other culinary experts who make this place everything that it is. And now that I’m contentedly in this for the foreseeable future, I’m excited to start exploring and learning from this broader community of experts outside the walls of the school. Incidentally, my first foray, once again involved bread. Last week I was assisting a Breakfast Breads class at the school taught by Javiera Montoya. Formerly a financial analyst in Santiago, four years ago Javiera, like me, gave up the office for the kitchen and has spent that time mastering the art and craft of bread baking. Over the course of class we made the smoothest brioche, butter-rich seemingly beyond its means, and baked til dark golden and glistening, as if sunned on the beaches in Javiera’s native Chile. That same brioche, we then rolled impossibly thin, spread thick with chocolate and twisted round itself to make a babka that shattered at the first bite and melted away by the third. Finally, we rounded out the carbo-load with the milky-sweet chew of her brilliant English Muffins, commanding and crusty and craggy pillows atop which rested a poached egg under a blanket of hollandaise. As we cleaned up following the meal, Javiera mentioned that the next day she was holding her first workshop at her new bakery and studio, Vituperio. It would be a sourdough pizza clinic and she wondered if I might come to check it out. Almost catatonic, and unable to even think about eating more bread, of course I agreed. Javiera left her job in Santiago and moved with her husband José (a beer and bread enthusiast who helps Javiera with the bakery) to Pennsylvania in May 2017. Before opening Vituperio last year, Javiera studied in the Art of International Bread Baking program at the International Culinary Center in New York. Since then, she’s worked and apprenticed at bakeries in New York, Pennsylvania, and Chile. Now, it was my turn to learn from Javi. Her bakery was beautiful, a church of bread, all light and stainless steel, the steam-injected ovens our altar. Sun from the two-story windows played with the flours - fresh-ground whole-grain from Castle Valley Mill in Doylestown - floating in the air. 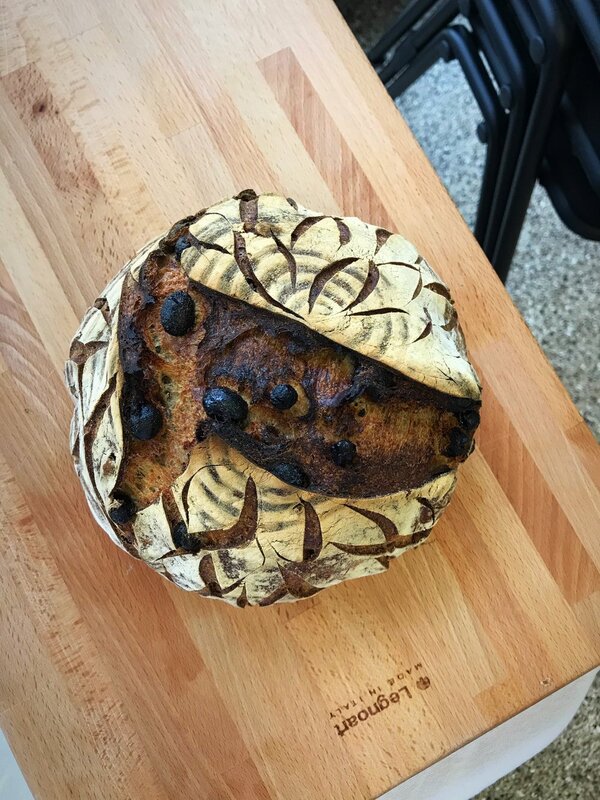 I met the other students as we clamored for buttered slices of Javi’s Einkorn-Spelt and Whole-Grain Raisin sourdoughs, a mix of experienced and beginning bakers, another FCS alumna (frustrated at her starter’s propensity for dying), all of us pizza lovers. We surrounded the tables assembled with bench scrapers and bowls of flours, salt, and starter. Then we got our hands dirty. Over the next three hours, we mixed our dough, folding every 30 minutes to develop that glutenous chew. As we waited, Javi passed around a number of her starters for smelling, some heady and sour, others more mild and nutty, depending on the flours used. She talked about the ideal flour to start a starter (enzymatic rye) and the best temperatures to invigorate (around 80˚) or maintain it unused (in the fridge). Fingers caked in flour, we diced onions and garlic for sauce and sliced mushrooms and olives for toppings. 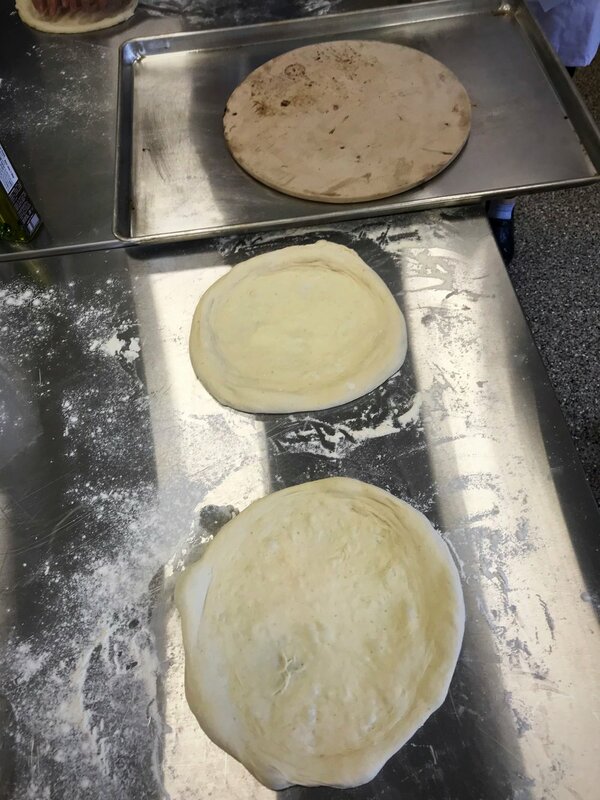 Then, in a made-for-tv swap out, Javiera revealed a separate batch of risen and fermented doughs, ready for shaping and baking. The resulting pizza, blasted for only a couple of minutes on the floors of those professional ovens, smelled of toast, sour, and char. The crust (or el border as they say in Chile), we were encouraged to make wider than I usually might, and ballooned up around the saucy center. Just crisped on the outside, it was light, airy, and yet provided resistant chew. The flavor, thanks to the starter and those Castle Valley flours, was exceptional, a slight maltiness cut with the grape-y sour. All of this evoked a perfect sourdough loaf, one which happened to have toppings and be shaped like a pizza. For the first time in those three hours, the entire bakery was silent. As I considered how incredible it was that The Farm Cooking School - built conceptually upon everything that bread represents: community, togetherness, and sharing meals - connected me with Javiera, José realized that they had forgotten to share with us the meaning of Vituperio. Fittingly, more an idea than a precise definition, Vituperio refers to an informal gathering of old friends over food and drink. No wonder Javi and her breads are such a perfect fit here at the school.